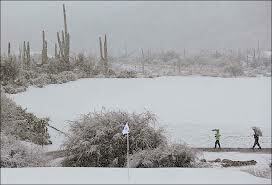 Any of my pals who watch golf, or even just watch the news, know that winter came to Tucson yesterday! Punxsutawney Phil obviously needed to be a little more observant! Needless to say, golf at the Accenture Match Play Championship was put off for the day. It snowed at my house too, and rained, and sleeted and was downright miserable. My sweet little Misha insisted she needed to go for a walk while it was drizzling...unusual for her because she hates to get her feet wet, but when you gotta go you gotta go! I had taken her to the beauty shop just a few days ago, but her fluffy pure white coat was considerably less so when we came in from the walk. Doggies, and probably cats too, kick up the road muck onto their underarms and bellies when they're out in the weather! At least she didn't drag her pretty white tail in the mud too - she was enjoying herself too much! At least the sun is shining today! But my pony, that I had put out in the driveway yesterday for a free wash, wasn't quite as happy this morning! Oh, and remember, tomorrow, February 22 is National Margarita Day! The margarita cocktail—a famous concoction of tequila, Cointreau or Triple Sec, and lime juice—has been around since the 1940s. Every bartender in the world has put a unique spin on this classic, but no one knows who created the original. Dozens of people claim that they invented the margarita, including a bartender named Willie from Mexico City. He said that in 1934 he created and named the drink for his friend Marguerite Hemery. Another popular legend is that Carlos “Danny” Herrera developed the drink at his restaurant in Tijuana in 1938. He invented it for Marjorie King, a customer who was allergic to all hard alcohol except tequila, and didn’t like its sour taste. Another story is that the Dallas socialite Margarita Sames mixed up the drink in 1948 for a house full of guests. One of them was Tommy Hilton who later added the drink to the bar menu at his hotels. While the true identity of the tequila master may never be known, the margarita will go down in history as one of the most popular mixed drinks of all time.